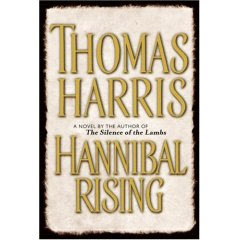 I'm not a huge fan of Thomas Harris, but I have loved the Hannibal Lecter books with a passion. Even the much-maligned previous book, Hannibal, I thought was pretty much aces (except for the end, which I thought just got silly). But I have say, if you love Hannibal, you should pass this one by. Better to remember fondly of our quirky flesh-eating doctor than to read this current installment. In Hannibal Rising, Mr. Harris treats us to the previously unknown origin of Lector. Where he grew up, what he was like as a boy, and what events transpired to make him into the happy-go-lucky madman we all know and love. The problem is, the book kinda blows. Every scene is told in an overview format, like you are reading the Cliff Notes version, or better yet, reading the summary of a script. And you know what? We probably ARE. The book has been out for about 2 months now, and the movie hits the popcorn stands this month. It seems pretty obvious that this book was just hastily written as an excuse to get the name "Hannibal Lecter" back in theatres. I listened to this book on audio, and it ran in at under 6 hours. 6 hours! In audio-book language, that's barely enough time to get to know a character, much less have the book end.